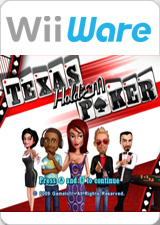 Prepare to experience the intensity of a real Texas Hold'em Poker tournaments! Whether you're a poker novice or veteran, you'll enjoy Tournament, Cash Game, and Heads-up modes with simple and fun Wii Remote controls. Hit the tables as one of 6 fun and charismatic characters, or import your own Mii character to really put on your poker face. Take on the world's most prestigious casinos - from Monaco to New York - and challenge opponents that won't hesitate to taunt or comment on your play style, creating a very realistic poker atmosphere! Or you can impress friends with wild poker parties thanks to an Online mode that allows you to play with up to 5 friends and create your own tournaments, in addition to joining official Gameloft tournaments. You can even challenge random online opponents of any skill level you want. Even if you've never played poker before, you can learn all the rules and strategy with the Advanced Tutorial that teaches you everything from winning hands and betting to bluffing. The graph below charts the compatibility with Texas Hold'em Poker since Dolphin's 2.0 release, listing revisions only where a compatibility change occurred. This page was last edited on 22 January 2018, at 02:41.